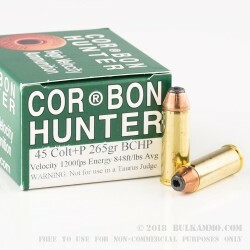 This 45 LC +P cartridge by Corbon sports a 265 grain bonded core hollow point projectile. The complete union between this bullet’s jacket and core makes separation between the two virtually impossible, optimizing the bullet’s weight retention for deep penetration and damage. 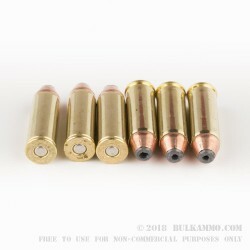 As a hollow point, this bullet will expand to a significantly greater diameter than its original size, making it perfect for hunting or self-defense -- whichever need should arise first. Please note that this is +P ammunition, and that only firearms rated for it can handle the higher internal pressure that it creates when fired. If you fire this cartridge in a weapon that isn’t rated for it, like the Taurus Judge for example, you should consider it a best case scenario if you only lose your pistol and not your ability to make shadow puppets as well. 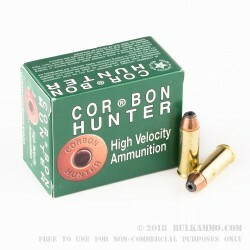 Corbon makes great expanding ammunition -- as a matter of fact, they were founded in order to perfect that very art. This cartridge’s impressive 1,200 fps muzzle velocity is meant to help its bullet mushroom perfectly every time. Q: What kind of chamber pressure can I expect from these rounds?